My friend Don Hahn has put together a two-volume set of books that took him almost 20 years to get published. 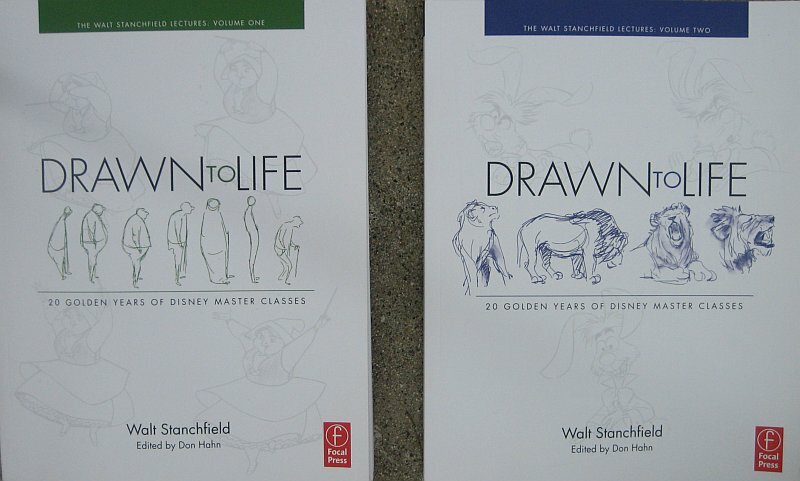 It is called DRAWN TO LIFE, and comprises the entire set of “handouts” that our gesture drawing teacher at Disney, Walt Stanchfield, distributed to all takers every week in the late 1980s and 1990s. Walt was one of those rare art teachers who made figure drawing accessible to us “cartoonists”, by making the poses and the ideas behind the poses the point of the drawing lesson, rather than the fine points of anatomy. These were “gesture” drawing classes that usually used clothed models holding props. It was OK with Walt to be as creative as we wanted to be with the poses, even turn them into Donald Duck if we wanted to, just as long as we caricatured the model’s gesture in a few well chosen lines. These books would enhance any art school that prizes traditional drawing skills, as the lessons transcend animation and give a lot of inspiration along with the lectures. Walt Stanchfield was an assistant and animator at Disney during the years 1949-1986. Before that he worked for the Charles Mintz studio in 1937 and Walter Lantz in the mid to late 1940s (the Fred Moore/Ed Love era). He started his classes in the late 1980s and taught through the 1990s, he died in 2000. Walt was amiable, sometimes he would draw a real quick little doodle right next to my labored-over gesture drawing, that got right to the heart of the pose in a few seconds. Sometimes, Walt wouldn’t get the pose either, and he was quick to admit his failures. He lived in Solvang, CA with his wife Dee and was a very good watercolorist as well as being a whiz at gesture. Walt was a very modest man, who played tennis nearly every day before work. He always described himself as “just a plodder”, nothing special in animation. If you praised him too much to his face, he could get riled, he thought compliments were insincere. I really learned a lot from him, though. If you get Vol. 2, there are about a dozen of my little sketches reproduced, even indexed! I never thought those little drawings would be in a nice textbook like this one, what an honor! These books have a cover price of $29.95, and well worth the tab, but if you lurk about Amazon, etc., you can probably grab a copy or two off for less. The great Focal Press of England is the publisher, they also did the little paperback “How To Cartoon” by John Halas and Bob Privett, in the late 1940s, I believe. These books deserve a space in any art school library, and deal with drawing, gesture, tangents and acting among a lot of other things. Get them, or just read them, you’ll be glad you did. 1. Fade in Exterior, Tom and Jerry’s Home–No Anim. We’ll continue on from here next week, let me know what you think. 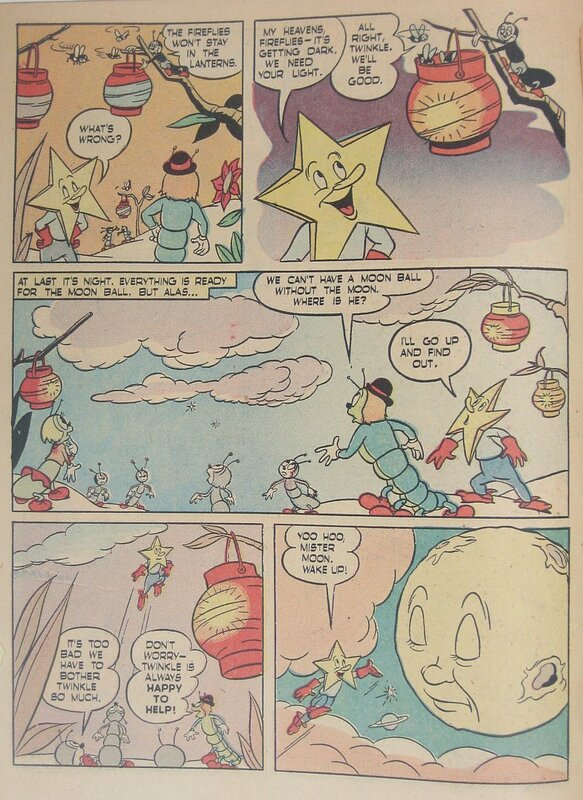 This week in comics we have the next two pages of “Twinkle, the Star who Came Down From Heaven” from CALLING ALL KIDS #7, any clues on who might have done the art? I love the relative sizes of Twinkle and the Earth’s Moon in the second page, I’m a sucker for fireflies in Japanese lanterns too. In MARVELOUS MIKE this week from 3/18 to 3/23/1957, Peggy Kimball is a big part of the action. It is revealed to her Dad, Mr. Kimball that she is the leader of the car “thieves”. Mike overhears her confession as he eavesdrops on her telephone conversation while she “babysits” him. Krazy Kat this week is from 8/7 to 8/12/1939. Edgar Bergen must have been on the radio in Garge’s house as he concocted this story of Ignatz making his brick talk through ventriloquism. A whole week’s worth of strips follows “starring” the brick. As always, I would love to hear your comments, see you next time. This entry was posted on Friday, April 24th, 2009 at 7:17 pm and is filed under Uncategorized. You can follow any responses to this entry through the RSS 2.0 feed. You can skip to the end and leave a response. Pinging is currently not allowed. Hello Mark, I just watched your pencil test of Its The Cat, and it was great! Nice work!! I think this is the first time I have seen your personal work, I’ve probably seen your work for various studios over the years without knowing it was yours. I’ve heard your name a lot over the years, good to see your drawings!! Thanks for your thoughts on the “It’s ‘The Cat'” pencil test. Did you ever see the color version when Cartoon Brew Films and Mytoons were running? If you could ever see your way clear to purchase a cel, you would be helping support our little short cartoons. As older pros, we cannot qualify for grant money, so contributions from our viewers are all we have to go on! Mark, how long was Surry at MGM? Did he go there immediately after leaving Schlesinger? I really don’t know how long Cecil Surry was at MGM. He seems to have gone over there at about the same time that Tex Avery left Leon Schlesinger. He seems to have gone there direct from Schlesinger, but I’m really not sure. Paul, the reason that I put the word “cartoonists” in quotes, is that since Walt Stanchfield’s time, the word seems to have picked up a pejorative connotation. Even the union changed it’s name from Motion Picture Screen Cartoonists to “The Animation Guild”, as I’m sure you know. I really admire and respect cartoonists, but I felt the use of quotation marks was appropriate in this case. I’m glad you got a laugh out of it! At some point this year I’ll be posting all 173 pages of The National Cartoonists Society Album, 1960-61. 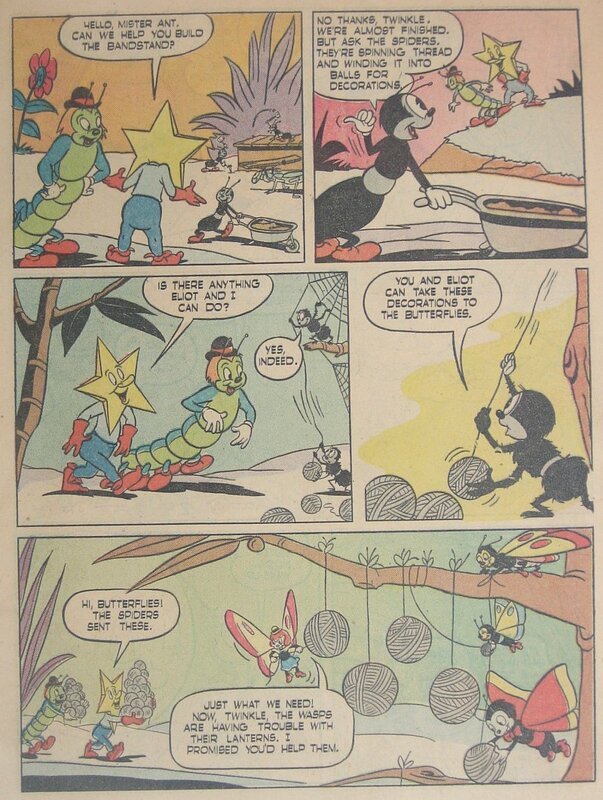 It might be interesting to see how many animation industry folk crossed over to the “dark side” of comic strips. Not all that many, judging by a cursory glance. But I can tell you that Walt Disney’s in there!